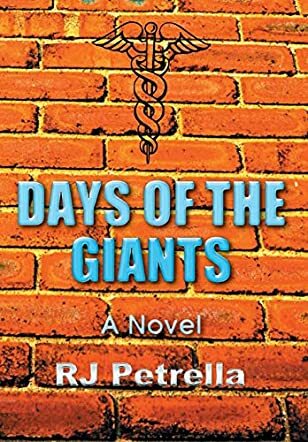 Days of the Giants: A Novel by RJ Petrella is set in the medical world of Boston in the 1990s. Slater Barnes is an intern at the Boston City Hospital, one of the most demanding medical arenas anywhere. The hospital needs a face lift desperately but, despite this, the staff are on a mission to treat their patients, no matter how little they have in the way of resources to call on. Barnes finds himself falling in love with the place and his job. Things change when the mayor of Boston, Peter Doyle, pushes through a major rebuild plan for the institution. At that point, city officials decide that they can make a huge profit in this and, in turn, they may threaten the future of the Boston City Hospital. Barnes joins the rest of the staff to defend the place, despite fighting a life threatening issue, until one of the hospital residents dies in suspicious circumstances. Days of the Giants: A Novel by RJ Petrella was rather interesting to say the least. I loved the way it was written as if it were a true story (although we know it wasn’t), and the way the characters told the story. The narration was split between Barnes and his father, rather than Mr. Petrella just writing about the characters. That made for an interesting slant on the story and I must say I found it rather riveting to read. I particularly liked the way the opening sequence was written, seemingly with no real connection to the story and open enough to go in any direction; and it soon became clear how it fitted in with the rest. Top marks, I thoroughly enjoyed it. I just finished reading Days of the Giants. I loved it. The author made it seem like a true story and I'm sure things like that has happened in real life. It kept my attention and it was truly interesting. I thought it was great how RJ Petrella wrote the book from the father and sons view. When I was done reading the book I wished it hadn't ended it made you want to follow them a few more months to see what else was happening in the lives of everyone. Very good book.